Lasang Pinoy as hosted this month by ChichaJo of 80 Breakfasts explores breakfast food. This months it also happens that I’m kicking off a brand new topic on poverty on Blogkadahan.com. As I was getting my posts ready, I realized how inter-twined the two topics were; at least in my personal experience anyway. I often mention my grandparents in my writings not only because I love them but because not only do they seem to be the source of many of my childhood memories it seems they also are the source of my traits and idiosyncracies. Frugality being one of those traits. As a child, I heard people say that farmers living in the provinces are poor. My grandparents were farmers and lived in the province, but for some reason I never thought them to be poor. There was always food on the table, and they always seemed happy. I took it for granted then, but I pause and think about it now especially when I am walking around the mega supermarket with a cart full of meats, produce, and every possible food items unimaginable by my grandmother. My grandmother always had a large household made up not just of her grandchildren when we visit during school breaks, but she regularly had at her table any number of relatives, distant cousins, nephews, nieces and sometimes just town mates who they employed to work in the house and the farms. I always wondered how she fed all those people with so little. When I started feeding my own family, and marvel at how much three girls can eat, it finally dawned on me the little tricks my Lola used to stretch a chicken or 4 eggs to feed 10 people. Breakfast usually consisted of whatever food is left over from dinner the night before. Once in a while though, especially if her hens have been generous, she would serve eggs for breakfast. She didn’t invent the torta by any means, but she sure utilized the technique every chance she got. She didn’t ever serve an egg sunny side up or over easy, she couldn’t afford to give each person an egg. Instead she utilized various means of stretching an egg. That means adding either tons of tomatoes and onions, adding a can of sardines, or in this case, potatoes. I happened to have some left over ground beef handy so I threw those in too. 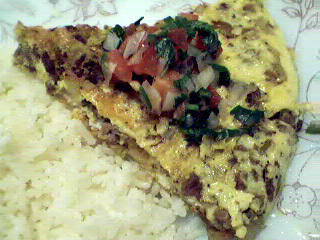 Ground beef and potato fritata or torta or omelet. However you want to call it, it's great for breakfast or a light lunch or supper. In a bowl, scramble the eggs and season with salt and pepper. In a skillet, heat about two tablespoons of oil and sautee the onions until fragrant then add the potatoes. Stir continuously until potatoes are cooked through. Add the ground beef and stir until warmed over. Remove the potato/ground beef mixture from the pan and add to the bowl of scrambled eggs. Return the skillet to medium heat and add 2 more tablespoons of oil. When heated, pour the egg mixture into the pan. Cook over medium low heat until the egg is almost cooked through. Carefully flip over and cook the other side. One trick I learned from a friend on flipping a perfect torta is to cover the skillet with a plate wider than the pan, flip the pan onto the plate so the torta is now on the plate uncooked side down. Return the skillet to the stove, and slide the torta back in to cook the other side. Comes out perfect every time! I’m going to fix this for breakfast in the morning. It looks so good. And thanks for the tip. I just hope it works for me. I will definitely try this recipe, I usually useground pork or dulong (dwarf goby), and tahong for my torta recipe. oooh, torta!!!! this is one of my faves too, especially with lots of eggs and made so that they’re a bit crisp. so ingenious, yet doesn’t skimp on taste. The coconut cake looks so yummy, and would like to try it as well as your torta recipe. Is it okay with you, if I’d link your site to mine? Hi Tin, I hope you got a chance to get an LP7 entry despite feeling low. I’ll check on your blog later. Hi Thess! Yes, me too, the older I get, I find myself doing things the way my lola used to do them. Hi Ces! Oh yah, ketchup is a definite must with torta, especially mafran if you can get it 😉 yummee! Hi Mae! thanks 🙂 the photo did come out better than I expected. I had to steal/borrow that last bit of tomato salsa from my daughter so I can take the photo. She just rolled her eyes at me again. hehe! Hi Sha! That’s true… my lolo always said at least in the province nobody starves. You can always find something to eat whether growing wild or farmed, edibles are always abundant. This is my kind of torta! Looks great – my tummy just grumbled looking at the photo. I would definitely wake up for this. good morning j! i just love this kind of torta..one i can’t do without catsup! yum! I like my torta this way…this is gooood, Jmom! your lola and mine were the same. we had a little poultry then and she used lots of eggs to, like what you said, ‘stretch’ it for the family members..lola used them all the time, and all of us apos carry on to this day her style of torta making.